My girlfriend says there's a laser treatment for your face that feels like you're repeatedly getting shot with a fully-extended rubber band. Which sounds terrible to me, and not really that much fun for either the recipient or the practitioner. Girls are so weird. At least with a Bandit, Bob Coulston's multi-action rubber band shotgun, projectile administration is a barrel of monkeys for one of the parties involved. Bandit Guns, according to Coulston, are the first of their kind that can fire in multiple modes. Models arise from 14 pieces of laser cut birch plywood, stacked and secured with bolts so no glue is required during (DIY) assembly. The Outlaw and The Sheriff hold 9 and 10 rubber bands respectively, and release their ammo either individually, in rapid succession, or as a single, collective "Oh, snap!" The Outlaw has two firing modes: 1) Pump the actuator once and pull the trigger to launch one shot; 2) Pump the actuator repeatedly and as fast as possible while holding the trigger back to unload a mass onslaught of rubber bands. 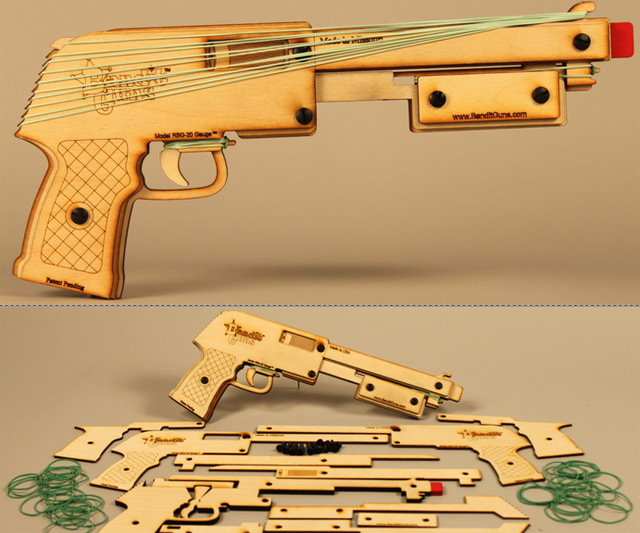 The Sheriff ascends to the next level of shoot-your-eye-out authority with three firing actions: 1) and 2) are the same as above while 3), The "Shotgun Blast", allows for pumping until all 10 rubber bands reach the top of the gun, at which point pulling the trigger releases them as a scattered kaboom! One that, Coulson says, "will knock over about anything." Well, anything that can be knocked over by a rubber band. Coulson's three kids were his inspiration for the Bandit Gun's creation, which is part of the reason he is selling the rubber band launchers as an assembly kit--something for kids and parents to do and enjoy together (though he admits that he probably uses his Bandit Guns more than they use theirs). He also promises the putting together part of the process is easy, and that the kits come with complete instructions devised and written in the USA, just like the gun parts themselves.